New Delhi : The BJP on Monday just managed to hold on to power in Gujarat, edging past the half-way mark to clinch a sixth term in government, but wrested Himachal Pradesh from Congress with a comfortable majority. In contrast, Himachal Pradesh lived up to its reputation of changing the ruler every election, as the BJP comfortably beat Congress, winning 44 of the 68 seats that were up for grabs. The Congress won 21 in the hill state where it had previously held 36 seats. Two seats went to Independents and a lone seat was taken by CPI-M.
Prime Minister Narendra Modi, who put up an aggressive campaign in Gujarat, camping in his home state for days, described the BJP's electoral victory in the state as "historic" as "in this age for a party to keep winning for so long" is unheard of. In his victory speech at BJP Headquarters in Delhi, Modi said the support for the party showed that "the nation is ready for reform agenda as every citizen wants India transformed". "I bow to the people of Gujarat and Himachal Pradesh for their affection and trust in the BJP. I assure them that we will leave no stone unturned in furthering the development journey of these states and serve the people tirelessly." In a message to his opponents, he said "let bygones be bygones" in a reference to the coming together of leaders heading caste formations to ally with Congress, to build a new Gujarat. After Modi's speech, the Central Parliamentary Board of the BJP met at the party headquarters in Delhi and decided to depute Finance Minister Arun Jaitley and General Secretary Saroj Pandey to Gujarat for holding consultations on choosing the new Chief Minister. For Himachal Pradesh, where the chief ministerial face Prem Kumar Dhumal suffered a defeat, Defence Minister Nirmala Sitharaman and Rural Development Minister Narendra Tomar are being sent to decide on a new leader. 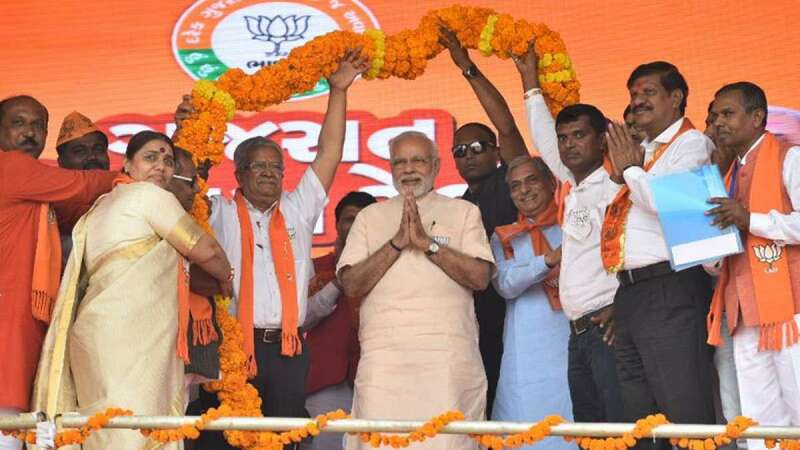 While the BJP celebrated all across Gujarat and in Delhi, the 99-seat tally in Gujarat was far less than the 150 seat target set by BJP President Amit Shah and 16 less than what it got in 2012 despite intense campaigning by Modi. The Congress, whose campaign was spearheaded by its now President Rahul Gandhi, conceded defeat but took a veiled jibe at the BJP. "My Congress brothers and sisters, you have made me very proud. You are different than those you fought because you fought anger with dignity. You have demonstrated... the Congress' greatest strength is its decency and courage," Gandhi tweeted. The BJP's overall vote share in the state plunged from 60.11 per cent notched in the 2014 Lok Sabha Polls to 49.1 per cent, indicating a sharp erosion in its support base in a state which the party considers its fortress. The vote share of the Congress, which joined hands with Patidar leader Hardik Patel, Dalit leader Jignesh Mevani and OBC leader Alpesh Thakore, soared from 33.45 per cent of 2014 to 41.4 per cent. Union Information and Broadcasting Minister Smriti Irani brushed aside reports of BJP's waning support, saying the winner was always the king. "Jo jeeta wo hi Sikander." The Gujarat election campaign was marked by viciousness that pitted Prime Minister Modi against Congress leaders, including his predecessor Manmohan Singh. It was the first Assembly election in Gujarat after Modi shifted to New Delhi. In Himachal, the BJP was set to form the government although its two top leaders -- Chief Ministerial candidate P.K. Dhumal and state unit chief Satpal Satti were worsted in the hard-fought contest. With Himachal in its kitty now, the BJP has 14 states where it has its chief ministers and rules with coalition partners in five others. Congress is now left with power in just four states -- Punjab, Karnataka, Meghalaya and Mizoram and union territory of Puducherry. Among the top winners in Gujarat, Chief Minister Vijay Rupani from Rajkot West, a seat formerly occupied by Modi, by a margin of over 50,000 votes. His deputy and Finance Minister Nitinbhai Patel won by 7,951 votes in Mahesana. The BJP held on in most seats affected by the Patidar agitation, provoking community leader Hardik Patel to complain about faulty Electronic Voting Machines. While the BJP dominated over the Congress in South, Central and North Gujarat, the Congress held the upper hand in the sprawling Saurashtra/Kutch region. The BJP also proved its sway over urban centres while the Congress seats came mostly from rural regions. Four of the six Congress turncoat legislators in Gujarat who had bagged BJP tickets lost while some of the Congress' prominent state leaders, including Shaktisinh Gohil and Arjun Modhvadia were also humiliated. All Congress Chief Ministerial contenders lost -- Shaktisinh Gohil (Mandvi), Arjun Modhwadia (Bokhiria) and Siddharth Patel (Dabhoi). But the BJP suffered a setback in Unjha constituency which includes Modi's hometown Vadnagar where he grew up. Dalit leader Jignesh Mevani, who contested as an independent with Congress support, won from Vadgam seat defeating BJP's nominee Vijay Chakravarti by 19,696 votes. In Himachal, key winners included outgoing Chief Minister Virbhadra Singh. Among those who lost in the hill state was BJP's Chief Ministerial face P.K. Dhumal and his confidants Ravinder Ravi, Gulab Singh and Randhir Sharma, all outgoing legislators.